My mom never liked jams, but Dad loved them. But then, one summer, our plum tree nearly fell over, it had so much fruit. She said: "There's only one thing to do: make jam." And while I worked, she told me about how she learned to make jam from my grandma (her mother-in-law), and how she used to make it for Dad because he loved it so much. And how they planted fruit trees just so that she could pass on this timeless, happy skill. And then it 'a full rolling boil,' and we rushed to can the beautiful jewel-like jam. It was, and I know it sounds corny to say, a complete revelation. I had no idea jam tasted like actual fruit. Since then, I have spent countless hours preparing jam for my friends and family. 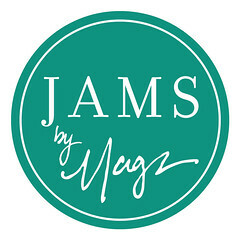 My jams are homemade in small batches, with 100% local produce, organic sugars and the highest quality spices. The recipes are original and have been developed over the past ten years, after many a trial (and not too many burns). They use half the sugar of grocery-store jam which helps preserve the full, ripe flavor of summer's best crops. All photos by Kim Maxwell Vu, copyrighted, Jams by Mags, 2011. Logo designed by Daiva Liktorius Grubb, Design in August. Webdesign by Margaret E. Perry.